"Legionnaire's Disease, which can be caused by improper maintenance of cooling towers and HVAC systems, strikes 25,000 People and kills over 4,000 people per year." - (Centers for Disease Control - CDC). We are NADCA certified members. The air duct cleaning industry has gained recognition over the last several years due to the increased emphasis on indoor air quality. The National Air Duct Cleaner's Association (NADCA) has been integral in spreading awareness on this topic and regulating the industry as well as being responsible for innovations in the way air duct cleaning is tackled. There are many air duct cleaning companies that compete for consumer business. However, only a small percentage of such companies are NADCA certified. Acquiring NADCA certification involves rigorous training, an examination and continuing education on an annual basis. All NADCA companies must adhere to certain standards and protocols when cleaning air ducts. This is what sets NADCA companies apart from what is referred to in the industry as "bait and switch" or "blow and go" companies. Such companies often entice consumers by using money mailers or coupons and promising extremely low prices for their services, such as $85 for an entire house cleaning. Not only do such companies use inappropriate methods to clean the air ducts but (i) they lack knowledge about the air duct cleaning industry, (ii) their equipment is sub par, often times they use a shop vac to complete the job, (iii) they end up leaving the air duct system as dirty, if not dirtier, than it was before they started and finally, (iv) they are dishonest. To make matters worse, their once promised low price ends up being 5-10 times the amount originally advertised. The drastic increase in cost is usually blamed on hidden fees not included with the job such as cleaning of all of the vents, the cleaning of a return or supply duct line or even components of the air handler unit, all of which are included in a standard price quoted by a NADCA company. Consumers who hire these coupon companies, unfortunately, don't take the time to read the fine print and are left not only with a dirty air duct system but an empty pocket. Although the up front cost quoted by a NADCA company might appear slightly more expensive, by the time the job is completed it will more times than not be less expensive to use a NADCA company than a coupon company. NADCA companies do not quote jobs using hidden fees and in addition, the ducts will be cleaned properly. 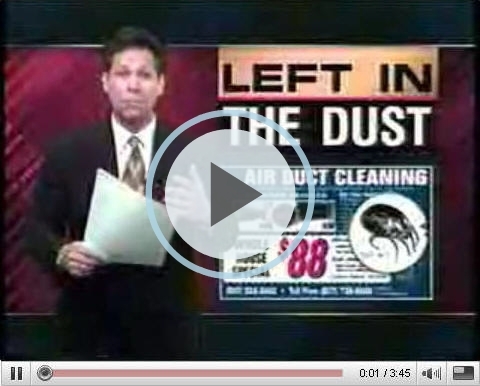 Please take a few moments to watch the below clip to see what happens when non-certified air duct cleaning companies, which have used coupons to entice the consumer, are hired. 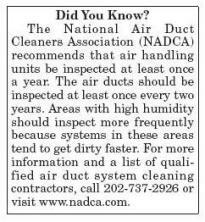 As the sole Washington, D.C. NADCA certified company, our goal at Dapper Ducts, Inc. is to educate you about the importance of indoor air quality and choosing a NADCA certified company to complete the job. If you would like to verify the NADCA membership of a company, visit www.nadca.com.